Stamp a Sweet Impression: It's what sunflowers do. It's finally Friday and I'm so happy it's my day to post something fun for you! I've been hoarding this unfinished frame I bought from Michael's quite a while ago and I thought it would be perfect to fix-up and stamp on and embellish, and... well, you get the idea. 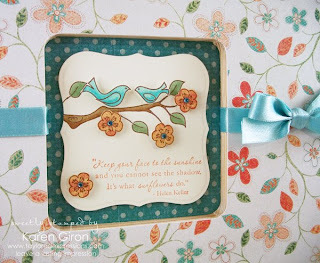 I've wanted to make a framed sentiment for quite some time and the new set, Faith & Hope, is perfect! I traced the frame onto a piece of Bloom & Grow paper from My Mind's Eye and then used ModPodge to glue it to the frame; I sanded the edges of the paper after gluing it so the edges would be smooth and even. 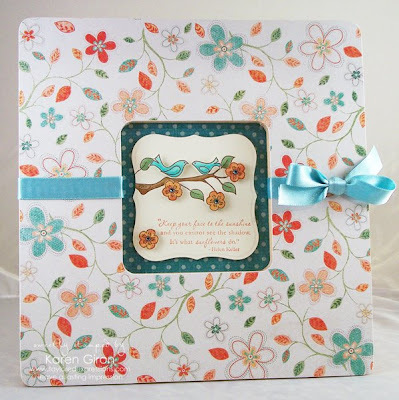 The stamped images are from Branching Out and Branching Out Coordinates - I paper pieced the flowers and used Copic Markers to color the other images, and no flower is complete without a Tiny Twinkle! The sentiment says "Keep your face to the sunshine and you cannot see the shadow. It's what sunflowers do." - Hellen Keller. Isn't that fantastic?! This has to be one of the easiest ways to spice up an otherwise ordinary frame. I love altering houshold items, and this one is relatively quick and easy. Thanks so much for stopping by today and please be sure to sign up for the Taylored Expressions newsletter so you don't miss a beat! You can sign up on the Taylored Expressions homepage. Karen, this is absolutely beautiful!!! You are soo talented! Thanks for sharing. Karen, this is sooo pretty! Love the softness it has! This is SO pretty!! I just love that MME Grow DP. Beautifully done, Karen! ooohhh..I totally agree with the others..this is totally beautiful! This is GORGEOUS Karen!!! I love altering frames and this particular one from Micheals is one of my faves. The image and sentiment are just perfect together!!! This is FANTASTIC! You make me want to head out to Michael's and purchase this frame! This is ABSOLUTELY GORGEOUS, Karen. Love everything about it...this is just the sort of card anyone would enjoy receiving. TFS. So cute, Karen! I think I have one or more of those frames sitting around. Your design is inspiring! I love that paper, and I have it, need to get it out and use it! Thanks for sharing. Wonderful project! That would look perfect in MY home! hehe! I have wondered how to get paper to stick nicely to wood and other type of materials. It seems that ModPodge is a good product for that. Thanks for the info!